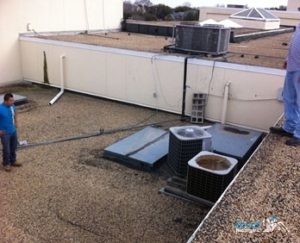 Dallas, TX Flat Roofs - Commercial Roofing Installation And Repairs! In commercial roofing, flat roofs encompass many different systems. Most commercial buildings have a low-slope or flat roof, which is why most of our commercial services are centered around Dallas, TX flat roofs. Eclat Roofing has over 15 years of experience serving the DFW area with quality flat roof repairs, installation and maintenance. We want to bring you superior services to make sure you have as little trouble as possible with your commercial roof. Call us today at (214) 373-1500 for your flat roof service! All of the flat roofs we install and replace have the potential to last for decades. Modified bitumen roofs involve asphalt as an adhesive for an extremely strong roofing material. Built-up roofs sometimes include aspects of the modified bitumen process or materials reinforced with more layers. EPDM roofs (or rubber roofs) involve rolls of rubber that are adhered to the surface of the roof for hail-resistance. TPO roofs are energy-efficient, recyclable, and like the above roofs, very durable. Our certified roofing contractors can handle all these commercial flat roofing issues and more to help your company’s roof last for as long as possible! To combat all these problems, we offer maintenance for all commercial roofs! It is a good idea to schedule routine maintenance so our roofers can catch and fix any problems on your roof before they turn into more expensive repairs or replacements down the line. Eclat Roofing strives for long-lasting durability for all of our Dallas, TX flat roofs. We only use the best roofing contractors for our commercial projects, because we want to put a roof over your company that will last for years to come. Get the most out of your commercial flat roof. For your roofing service, call us now at (214) 373-1500! Updated on September 13, 2018 at 3:06 pm by Eclat Roofing.